I know what you are thinking…..fergodssake! More about jaws! Yep. This is the last one, I promise. As you know I decided to use blue l.e.d. lights with this project. Normally I would bunch lights and put them in the back of the jaws. But these jaws will be more closed, so I’m trying something different. 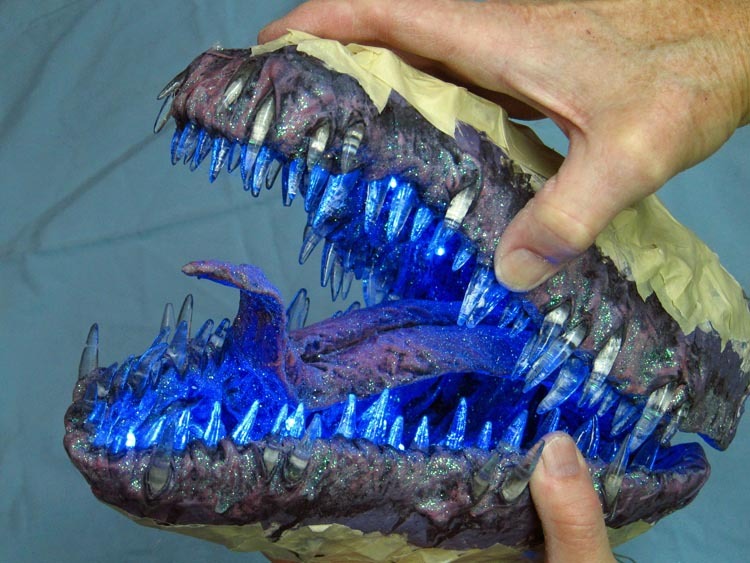 I really want the icy teeth to reflect the blue light. 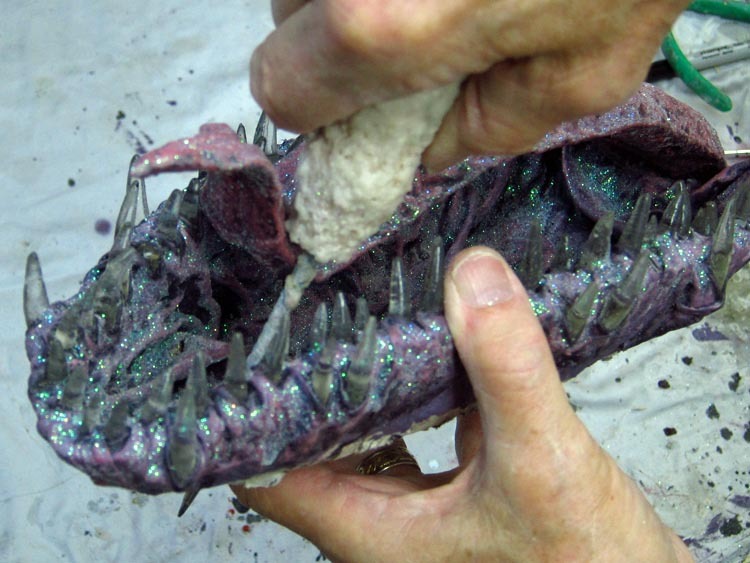 So I punched holes in the jaws and inserted the l.e.d.s into them. Then I taped the loose wires on the outside. What is great about this is that these l.e.d.s blend into the jaws when they are off. And when they are on, they do a nice job of reflecting the light, just as I wanted. The real fun is coming soon. Assembly. 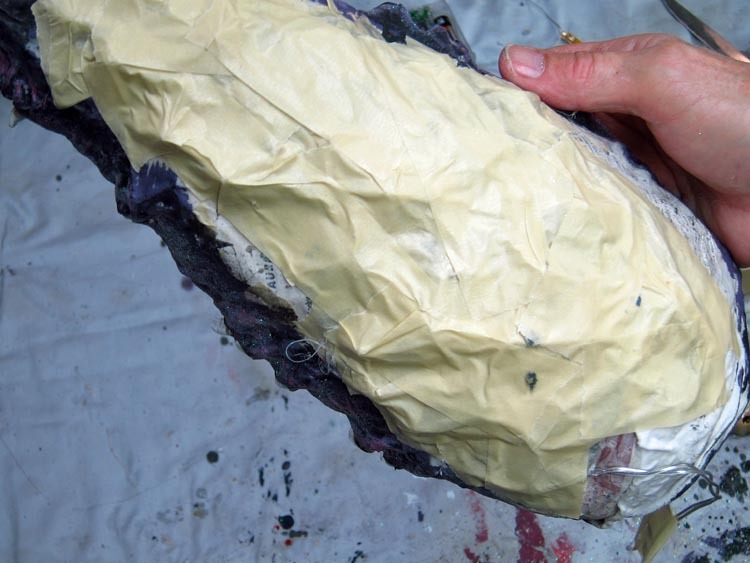 This entry was posted in Paper Mache Ice Dragon and tagged fantasy, Game of Thrones, paper crafts, paper mache, paper mache instructions, paper mache recipes, papier mache. Bookmark the permalink. You are too funny Bridget! I do like the look of these jaws. I hope the lights work as well when it’s all put together. I may have missed it,but what brand/ type of resin seems to work best? Hi Christine. I’m using “Clear Lite Casting Resin”. I get it at TAP Plastics. Awesome. 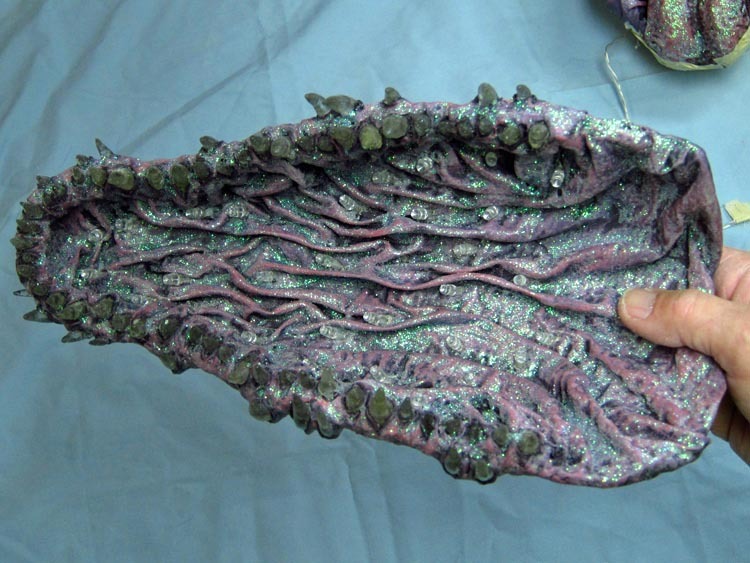 I will have to see if I can get some- your project made me re-think a project I’ve been stalled on and I’d like to see if I could use your technique to make some horns and spines in a similar manner. We’ll see how it goes! Locally the CLear Cast resin that the stores sell is okay but veery touch mixture wise and always bubbles even though it isn’t supposed to, even with the trick of carefully using a heat gun to try and get them to rise out. You can get a lot of the bubbles out by poking it with wire before it sets. And of course stirring carefully. I’m sure you have done those things. Please don’t be sorry about doing more jaws. 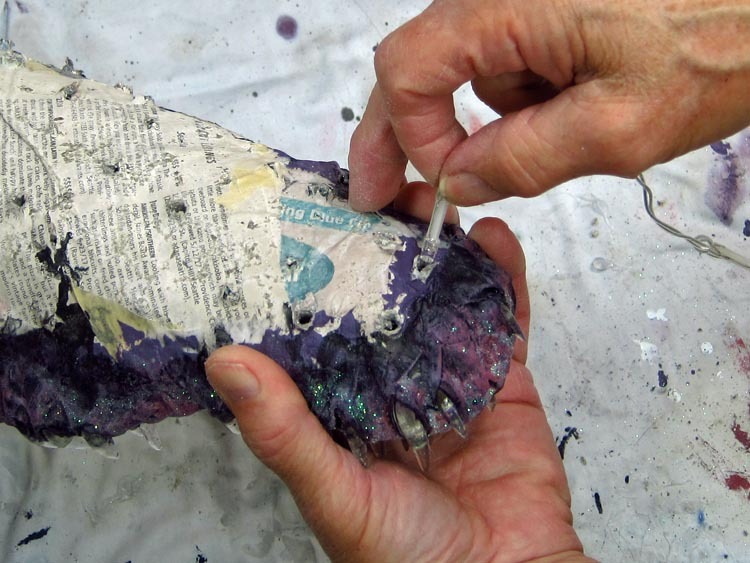 I get so inspired with what you do and have started my first paper Mache Dragon. I make cloth dragons for a while now and even design my own patterns, so this is another out let for my passion and love of Dragons. keep inspiring us rally we love it. Thank you for the nice remarks Suze. I am on to more fun things in the assembly. I just have to get another post together. I can never get bored with your posts! I think you and your work is amazing and i would love to be able to do something like the dragons you do. I have bought the books but still fail miserably. You are an inspiration though so i will keep trying. Thank you for everything! Hey Michelle. I’m sorry to say it isn’t going as planned. I’m always happy to answer questions if that will help. Give it another try. It’s worth the effort I think. Ok Dan this Beastie is starting to look quite freaky lol. Thank you David! Glad you like this one! Thank you Sandra! Much appreciated! That looks fabulous! What a great idea to show off those ice cool teeth!! Thanks Sue! Hope all is well. Brilliant! Love the jaws, love the lights, never get tired of your posts, Dan! 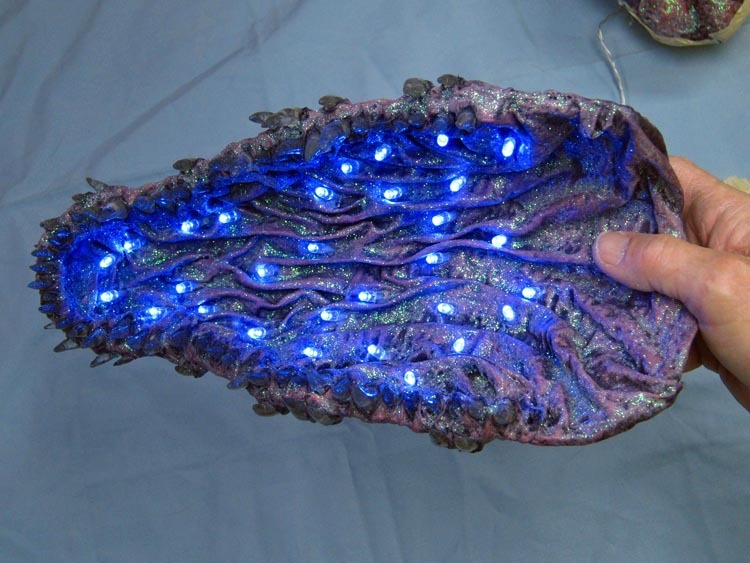 Wow, the combo of resin teeth and blue LEDs is absolutely spectacular! Thanks Stella! That’s a great compliment from someone like you who is so creative with materials! Looking awesome, can’t wait to see the rest. Man, Dan you are just so creative and you make this look so easy. 3 cheers man! Well done so far! Thank you very much Tim! It is much appreciated!